City Accelerator Guide for Embedding Innovation in Local Government was the first in a series of three Pilot Projects launched in early 2015 to test Living Cities' hypotheses around open-sourcing social change. Learn More about Open-Sourcing Social Change. As part of that commitment, our knowledge and communications strategies focus on creating and disseminating tools, resources, content and digital experiences that will advance thinking and spark conversation. 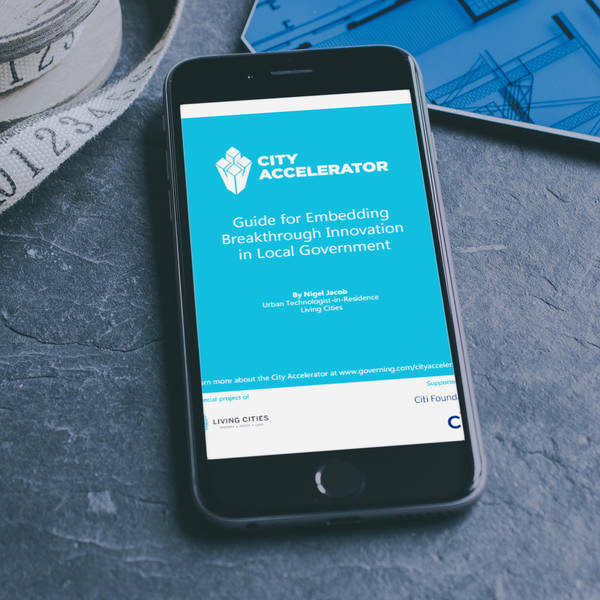 The City Accelerator Guide for Embedding Innovation in Local Government (the Guide) was the first in a series of three Pilot Projects launched in early 2015 to test our hypotheses around what it takes to open-source social change and continuously improve. The City Accelerator Guide (the Guide) was published on January 12, 2015 as a downloadable guidebook that was aimed to reach practitioners like those participating in the City Accelerator, influence the practice of local government innovation and help advance local government innovation and urban transformation more broadly. For this Pilot, we worked with partners at the Citi Foundation and Governing.com to design a communications plan around a set of hypotheses, asking: “What does it take to achieve a deep level of engagement with an actionable resource, like the Guide?” We applied a broad array of measurement and analysis tools to measure the impacts of our communications and storytelling efforts with rigor. This report outlines our findings and lessons learned. For comprehensive view of our data and insights, download the full report. We tracked user behavior along a “ladder of engagement.” The ladder shows how we mapped different types of user interactions to analyze traffic trends to find patterns to help grow audience engagement. The City Accelerator Guide generated a high volume and quality of traffic along all three rungs of our engagement ladder. Our concerted efforts around marketing the guide were successful. We successfully showed return-on-investment across the key practices we tested, and discovered some new insight. 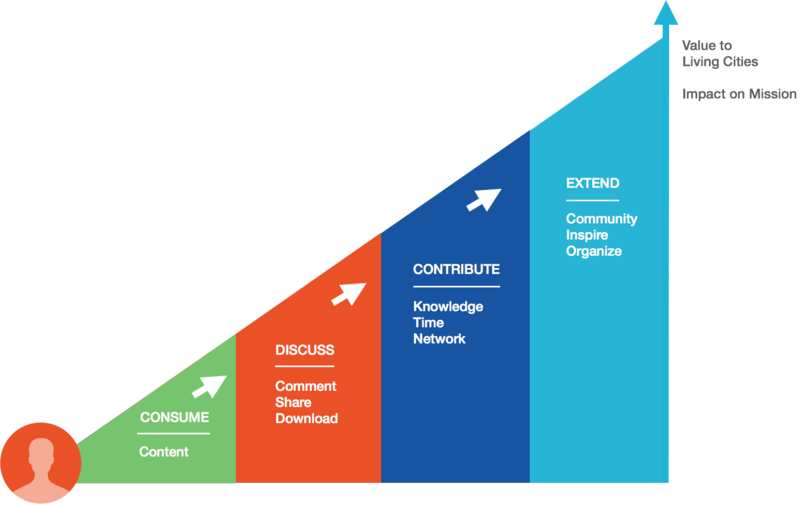 Measuring Storytelling for Social Change: What’s the Special Sauce? Our Assistant Director of Strategic Communications and Storytelling introduces our work to measure what works and what doesn’t in terms of Open Sourcing Social Change. 1) By intentionally aligning our promotion efforts with those of partners whose audiences already turned to them as reliable sources of information on public sector innovation, we were better able to reach our key targets and stakeholders in the field. 2) While our key goal was to get the Guide in the hands of practitioners, our strategic efforts to disseminate and promote the Guide to new audiences, especially on social media, had the added benefit of driving traffic and conversation more broadly across the Living Cities website. 3) By targeting our promotion efforts on platforms where we could “meet people where they were”, we saw an increase in sharing and cross-posting behavior, suggesting audiences liked what they found and/or felt it would be valuable to their broader network. 4) The Guide was widely shared on social media, especially LinkedIn, where it out performed all prior resources created and distributed by Living Cities on that platform. By the end of the pilot, we’d discovered a hunger among LinkedIn users for practical, actionable content. 5) During the Pilot period “events”, or individual actions that users took on a page, accounted for 16% of all actions taken by users across the Living Cities site. This suggests that we smartly promoted, packaged and produced the Guide so that users were getting the content they expected.